Euro 2016: Wales end 57 years of hurt, but what was life like in 1958? 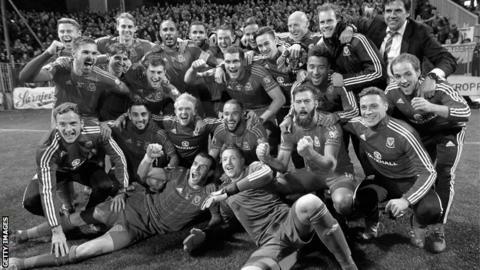 Many of the parents of Wales' current crop of internationals would be too young to remember the last time their country reached a major tournament finals. Not since 1958 have Welsh fans been able to cheer on their own team at a major international tournament, but they can now make travel plans for France after Wales' qualification for Euro 2016. In 1958, newspapers rather than the internet listed football scores; coal was king in Wales, and a red phone box would be where you would make a call, with mobiles still decades away. How does the footballing landscape compare? Chris Coleman's side have earned their place in France by winning five of their nine Group B matches and drawing three. Wales' route to the 1958 World Cup in Sweden was far less glorious. In fact, John Charles and his team-mates failed to qualify. They finished second to Czechoslovakia in their qualification group, but were thrown a lifeline in the unlikely form of global political unrest. Israel had won their section by default as no African or Asian country would play them following the Suez crisis of 1956. However, Fifa were reluctant to allow a team into the World Cup finals without playing a match. Wales were picked to face the Israelis in a two-legged showdown and secured their place at the World Cup with a 2-0 win at Ninian Park on 5 February, 1958. The world was left in shock the day after Wales booked their place at the 1958 World Cup when 23 people, including eight Manchester United players, were killed in the Munich air disaster. The British European Airways (BEA) plane crashed during take-off after it had stopped to refuel in Munich as the team returned from a European Cup match against Red Star Belgrade. Of the people to die, 21 did so instantly, while Duncan Edwards - described by former United temporary manager Jimmy Murphy as the "greatest of them all" - passed away 15 days after the crash. What happened to Wales in the 1958 finals? Wales drew each of their group games, a run that included a clean sheet against hosts and eventual runners-up Sweden. They then came from behind to beat 1954 runners-up Hungary 2-1 in a play-off and set up a quarter-final against eventual winners Brazil. A then unknown 17-year-old called Edson Arantes do Nascimento - Pele - scored his first World Cup goal, the only one of the match, and Wales were out. What else happened in 1958? Away from football, jukeboxes played rock'n'roll, the space race had begun and Sir Edmund Hillary reached the South Pole. In 2015, Cardiff is hosting Rugby World Cup matches, and in 1958, the Welsh capital was also temporary home to prominent sportspeople during the Empire Games - the precursor to the Commonwealth Games.